The INSAT-3DR is a weather observation satellite built by Indian scientists. The Indian Space Research Organisation (ISRO) Thursday conducted the first successful operational flight of its heavy -lift GSLV rocket with an indigenous cryogenic engine. The launch took place at 4.50 pm at Satish Dhawan Space Centre in Sriharikota. The GSLV F05, powered by an indigenous cryogenic engine in its upper stage, carried a 2,211-kg INSAT-3DR weather satellite, the heaviest launched from India, into space and into an “orbit very close to the intended one,’’ ISRO stated after the launch. 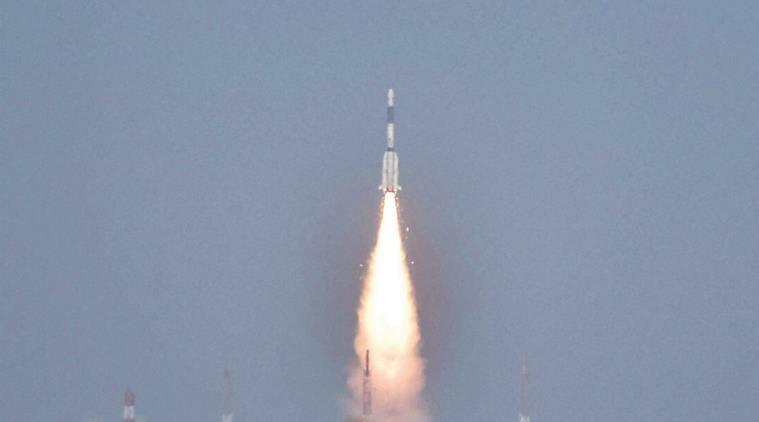 “The 40-minute delay in the launch was due to an anomaly observed in the functioning of a pressure release valve in the liquid Oxygen filling ground segment which was resolved later,’’ ISRO said. “About seventeen minutes after lift-off, INSAT-3DR was successfully placed in Geostationary Transfer Orbit,’’ it added. This was the tenth flight involving ISRO’s GSLV rocket. It was also the third successful flight with the indigenous cryogenic engine which powers the upper stage of GSLV rocket. The indigenous cryogenic engine was tested successfully for the first time on January 5, 2014 with the GSLV-D5. It also performed as per plan on the GSLV D6, which launched GSAT 6 communications satellite on August 27, 2015. The first GSLV flight with an indigenous cryogenic engine in upper stage failed on April 15, 2010, when the GSLV-D3 could not accomplish mission objectives. The cryogenic stage on GSLV uses liquid Hydrogen as fuel and liquid oxygen as an oxidiser. Compared to solid and earth-storable liquid propellant stages, it is a highly-efficient rocket stage that provides more thrust for every kg of propellant it burns. India first ventured on the path of obtaining cryogenic technology in 1992 with a two-pronged strategy of purchasing cryogenic engines from Russia and acquiring the technology from US. Following the 1998 nuclear tests, US refused to share the technology. ISRO used seven cryogenic engines sold by Russia for the early phase of its GSLV programme that began in 2001, while developing an indigenous technology simultaneously. The GSLV programme, which had stalled after the April 2010 failure of GSLV-D3, and a launch pad leak on the GSLV-D5 on August 19, 2013, has come back on track over the past two years. The successful testing of the indigenous GSLV paves the way for preparations for India’s second mission to the moon Chandrayaan 2. India is among six nations — the others being the US, Russia, France, Japan and China — to possess the cryogenic engine technology.